Okay, I admit it! I am a sucker for bright colorful things. I used to drool over all the cute toys in the store and on TV. The problem is most of them are plastic! Not only is plastic hazardous to your health, it is bad for the environment. It takes real effort to avoid it. Plastic is everywhere! Read more about the dangers of plastic. If you try hard enough, you can find some great alternatives. My boys and I have had the opportunity to play with some fun stuff. Kimberly from Happy Yiayia was kind enough to send us some wooden rainbow stacking blocks and a tie dye play silk. 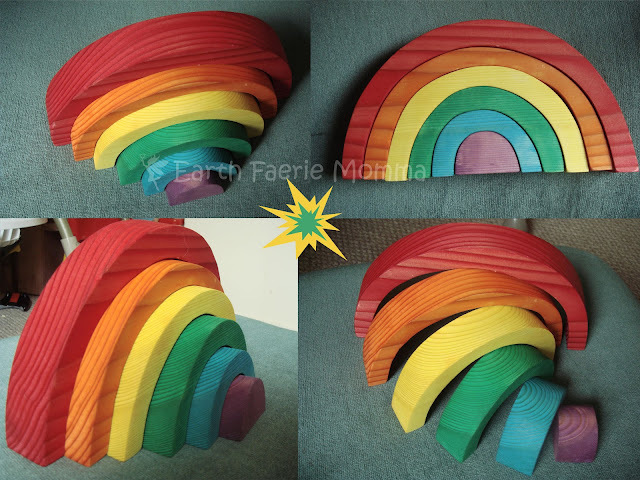 The wood stacking blocks are made from pine and the whole rainbow measures about 9-1/2 inches wide, 5-3/4 inches tall. They are hand painted with safe, non-toxic dyes and sealed with beeswax and olive oil. They are great for all ages. Both my 5 month old and 3 year old love them. They are safe if they find there way into my teething 5 month olds' mouth. They are nice and soft and the finish is beautiful. It is hard to capture their full beauty in the pictures. We have had a lot of fun playing with them. The play silk is wonderful. It is a unique piece of art! It is made from real silk. The edges are rolled up and stitched. This one is about45" x 44". It is so soft. Connect with Happy Yiayia on FACEBOOK! Happy Yiayia carries a great selection of tie-dye items! Visit Happy Yiayia on Etsy to get your own. Earth Faerie Momma readers can use the coupon code THANKYOU for 10% off (expires July 1st). 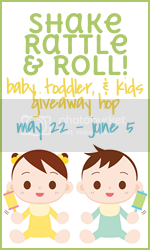 Come back May 22-June 5 for the Shake, Rattle and Roll Event and enter for a chance to win a prize package including a $25 credit to Happy Yiayia! Open to the US & CAN.